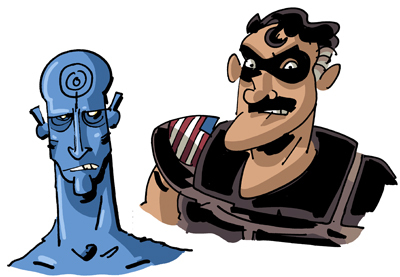 Another 20-minute color sketch: Watchmen! Or as many of them as I could do in 20 minutes without reference. Alan Moore's basic thesis when writing Watchmen was that if superheroes existed in a "real world" they'd all have to either be delusional or sociopaths, and it would be impossible to escape the adult themes that, once introduced, would tear the narrative's world apart. Everybody reads it and thinks "hey, let's write superheroes as if they existed in the 'real world' and introduce adult themes!" It's like when Upton Sinclair wrote that book to get people to concern themselves with the horrible working conditions for children in the meat-packing industry, and everybody was like "ew, look what's in a hotdog," only worse.